Being a female airsofter in a male dominated sport. Here's a blog post I've been planning on doing for a while, a piece about what it's like to be a female airsofter in such a male dominated sport. The shooting game isn't just an old boys club anymore. Women are the fastest growing demographic in shooting sports, these sports include hunting, target shooting, airsoft and archery. As you all know I belong to the airsofting category and although we are heavily outnumbered by the lads, we are growing in numbers. Since the start of my blog it has been my mission to get more girls into the game and this is something I am hugely passionate about! 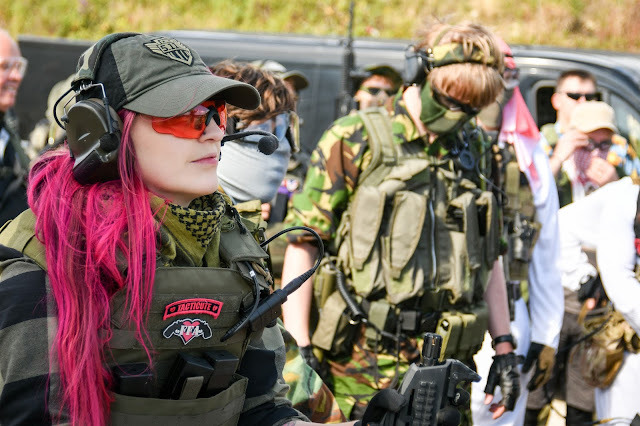 Now female airsofters are indeed a rare breed, and although we don't ask for any special treatment, because there are so few of us we do face some incredibly varied reactions from the airsoft community. Then there's a whole other breed of guys - the ones that won't shoot a woman, or tell others to go easy on you. Let me tell you something, I won't go easy on you, for all intents and purposes we're at war and I want to win. If you run at me and decide not to shoot me because I am a girl, I promise you that you will get lit up like a Christmas tree. I want to be treated like an equal so if you can see me, shoot me! Still, all this doesn't put me off, instead it makes me work harder and push myself more to put to rest the stereotypes and it makes all the great things about being a female airsofter that much better! I have met some great friends through airsoft and there's definitely a sense of camaraderie between our team. The encouragement and support you get is fantastic and the community is more than happy to help with advice about equipment and guns. But that's not the only great thing! Hey, love your post and blog! Its great to read about another airsofter who's also in the UK. I have been playing airsoft for just under a year and love it! I was introduced by my best friend and played my first game in a CQB site with three guys. One of them did try the whole 'under my wing' thing but after end of the first game I was last member standing and had 5 kills to my name. Since then all the guys in our squad are totally cool and help me out with any problems or questions. I do occasionally find that after a game has ended and we're back at base that when I remove the full face mask that a couple of guys have been a bit grumpy they lost to a girl, or just confused that a girl plays at all. I am thankful that at the outdoor site (Apoc in Ashford) is pretty equal players and many of the guys don't treat the girls who do go (max of 5) any differently. Thanks for your wishlists and other suggestions, will totally check them out for improving my loadout. Hi Kat! Sorry about the late reply, I didn't see your comment! Thank you so much for taking the time to write to me, and thank you :) I'm really glad you enjoy reading Femme Fatale Airsoft :D it's greatly appreciated. Thanks again, have a wonderful evening. This is a very well written post dissecting the mine field that Female Airsofters have to navigate every time they suit up and get out there to play with the men. It is always encouraging to see positive attitudes like yours being added to effort of advocacy and exposure for Women wanting to join the sport. I know my wife has received plenty of choice comments on any number of asinine topics when all she would like to be doing is laying down as much fire as the boys. Thankfully her attitude is very much in line with what you have put forth here — it simply motivates her to get better every time she gets out there and silence the haters with her effort and passion for the game. Thank you for being a positive voice and for bringing attention to an issue that, whether we want to admit it or not, is one that women looking to break into the community have to endure. This industry/hobby/sport needs more women who understand the hard knocks that come when you have to deal with the less mature members of the community, then seek to crush the stereotypes, aren't dissuaded by the negative elements, and then let their primary do the talking out on the battlefield. Thank you as well for the small plug of Wicked Wear Co.. I know Wicked and I have been very happy to throw our voices behind the effort — it has been an incredible pleasure and supreme honor to lend our talents and platform in the further exposure and continued advocacy for more women in the sport.